Lynne Denig owes her beginnings as a string player to the American public school music program where she started violin lessons at age 8 in Maryland. Lynne attended state universities in West Virginia, Illinois, and Iowa studying violin performance with Donald Portnoy, Paul Rolland, and Leopold LaFosse and viola with Gerald Lefkoff and Guillermo Perich. Lynne was a professor at Northern Michigan University; created and taught the violin portion of the Music Advancement Program in Durban, South Africa in a program for previously marginalized youths; was founder and board president of The Youth Orchestras of Fairfax; served as President of the Virginia chapter of the American String Teacher’s Association (VASTA) and on national committees for ASTA. She is a co-author of ASTA’s Certificate Advancement Program and has served as the Chair for Virginia’s Certificate Advancement Program. Lynne received the VASTA Chapter Award for Outstanding and Distinguished Service in 2006 and a Citation for Leadership and Merit from ASTA in 2008 for her work on ASTA CAP and in 2017 for her work on ASTA's National Board. 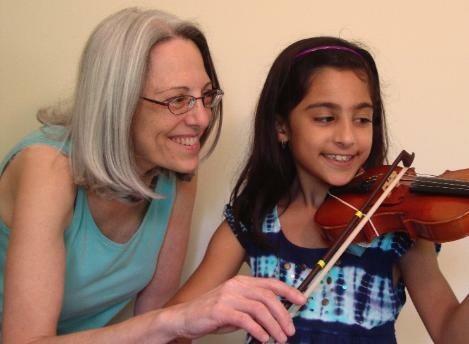 Lynne writes regular articles for the American String Teachers Journal, MD/DC ASTA’s Stringendo, and VASTA’s The Fingerboard, and has given presentations on chinrest fittings and Paul Rolland Pedagogy in the United States, England, Spain, and in Germany. Lynne maintains a private violin and viola studio in Fairfax, VA.
Gary Frisch, a past president of the Virginia String Teachers Association (VASTA) is a violin maker and dealer. 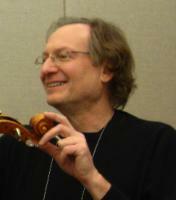 He owns and operates Gary Frisch Violins, located in Falls Church, VA. Gary trained in violin making under Deena Spear. Since 2005, Gary has teamed up with Lynne Denig creating the diagnostic approach for assessing appropriate chinrest heights, contour, and placement for all violin and viola players—student to professional. He presented at the ASTA convention in 2006, the International Viola Congress in 2010, and at numerous colleges and conservatories. In addition to crafting our lifted chinrests, Gary works with players to integrate the new chinrest with improved tone quality and projection. 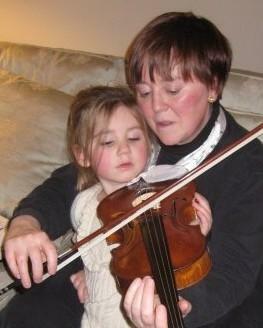 Barbara Greenberg has made playing with ease a focus in her teaching career. After graduating with her B.A. in Music Education she completed the two year teacher training course in Suzuki Pedagogy with Louise Behrend at The School for Strings in New York. She has taken subsequent Suzuki teacher training with Miss Mori, Helen Brunner, Ronda Cole, Linda Case and others. Continuing playing and pedagogy study has been with Kato Havas, Mimi Zweig and teachers trained by Paul Rolland. Throughout the last 10 years, Barbara has been studying the Alexander Technique and Body Mapping with Barbara Conable, Jennifer Johnson and Heather Buchanan. Having recovered from injury, she brings a personal perspective on body issues to her playing and teaching. Currently, Barbara is director of the West Windsor-Plainsboro Community Education Suzuki Program, one of two Suzuki programs that she has created in Central New Jersey. She has also directed the Suzuki Program at Westminster Conservatory in Princeton, NJ. She has been a co-director and clinician for numerous weekend workshops and is currently Assistant Director of the NJ Suzuki Workshop. Barbara has been quoted in STRINGS magazine on instrument sizing, shoulder pads and chinrest set up. She has presented at the NJ ASTA Symposium and twice at the ASTA National Conference. Barbara has visited numerous teachers' studios to fit chinrests to students of all ages, especially with the debut of the Frisch and Denig Fractional Chinrest line. In October 2011, she presented and did fittings at The Long Island Violin Shop. And later that month she joined with Leslie Webster to present at the NJ ASTA Symposium. Active as a fiddler for contra and English Country dance, Barbara is in demand both as a player and a teacher of fiddle and band workshops. She has performed in the U.S, U.K. and Europe and has recorded 7 albums of dance music.